• Aerobús . Bus service rapidly connecting the two terminals with downtown Barcelona (25-35 minutes), end stop Plaça Catalunya. The Aerobús' T1 line serves terminal T1 while the A2 line serves terminal T2. It runs every day from 5:30 am to 1:00 am. • Train . Line R-2 Nord (R-2 North), of the Catalan Regional Railway - Rodalies de Catalunya - connects terminal T2 with Sants, Barcelona's central station (19 minutes), Passeig de Gràcia (26 minutes) and Clot-Aragó (30 minutes). It runs every day from 6:00 am to 11:30 pm. • Taxi Cab . There is always a large fleet of taxi cabs available at the airport at any time, at either of the two terminals. Taxis charge an additional fee for airport service and for every suitcase transported. 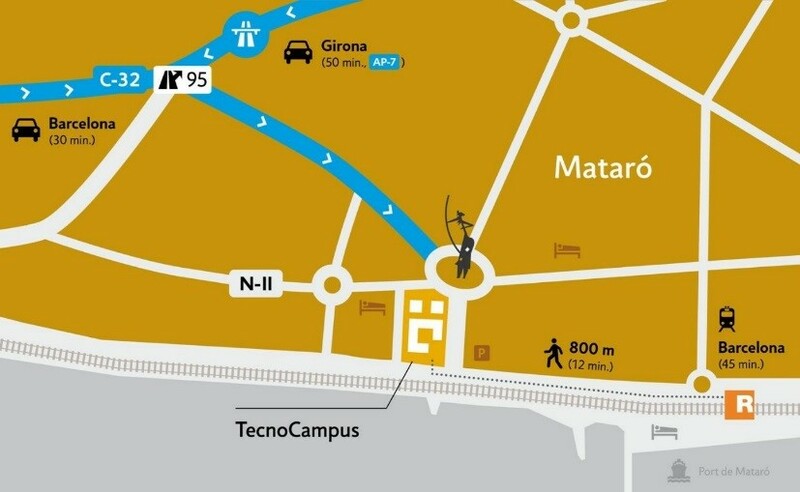 Take the train line R1 (stations in Barcelona: Sants-Estació, Plaça de Catalunya, Arc de Triomf, El Clot-Aragó) until Mataró station. Some trains terminate at Mataró train station and others trains at Blanes or Maçanet-Massanes but all of them stop at Mataró. TIP: we suggest you to buy a multi-journey ticket for 10 trips (T-10 3 zones), valid for train and buses to Mataró, and train, buses, tram and metro in Barcelona. It costs 26’75€ and you can buy this card in the metro, railway stations and newsagents. 2. Leave the motorway at the exit “Mataro Sud” (about 25 minutes from Barcelona). 3. You will come to a large roundabout with a huge metal sculpture, take the 2nd exit.